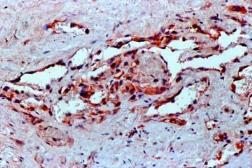 Specificity/Sensitivity: This antibody is specific to a cluster of proteins between 19-22kD (reduced). VEGF is a homodimeric disulfide-linked glycoprotein involved in angiogenesis, which promotes tumor progression and metastasis. It exhibits potent mitogenic and permeability inducing properties specific for the vascular endothelium.